This is not the first time that I am seeing the quote but I feel that now more than ever it has become relevant to me. I'm going to go through each sentence bit by bit and really deconstruct it for the sake of clarity. I'll just lay a disclaimer that I do not know who actually created this quote, I've just seen it around on the internet. 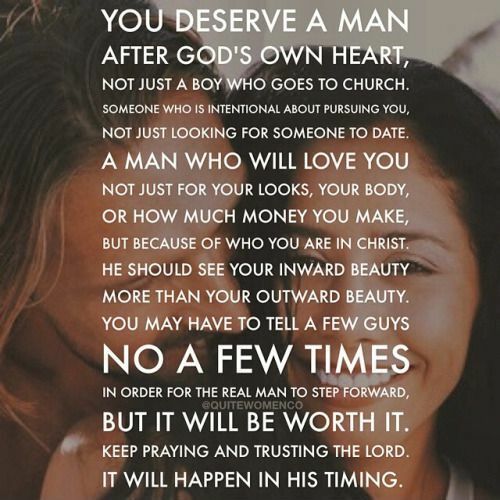 'You deserve a man after God's own heart, not just a boy who goes to church'. In order to warrant deserving a man who is pursuing God you yourself have to be in pursuit of God too. It seems obvious but you would be surprised that many do not know this. It is not enough for a person to just 'go to church' and often times we get excited when someone says they are a church goer. Whilst it's great to go to church and we should by no means discredit it we need to realise that there is a mixed multitude in church and many people are at varying stages of their walk with God. Some men and women even just attend church for a period in order to secure a 'God fearing man/ woman' when they themselves have no intention of pursuing God. We must be careful and we should 'test all spirits' (1 John 4:1). I have been guilty in the past of getting way too excited when a guy says he goes to church but it really is a case of 'by their fruits you will know them' ( Matthew 7:16). 'Someone who is intentional about pursuing you, not just looking for someone to date'. Now that we have established that it is more than just a person who goes to church, we can now say that the person should ideally be pursuing you. I will not be drawn into the semantics over dating vs courtship and what exactly is dating as I know definitions differ. What I take this to mean is that it should not be a person who is just looking to while away time; a relationship with no end goal or purpose. When I was younger I had an 'ideal' age for when I wanted to be married and now that I am older it can be tempting to just get with anybody just so that my time plan is 'achieved'. We need to be careful so that we are not just dating/seeing a person so that we can ensure we are married by a certain age. 'A man who will love you not just for your looks, your body , or how much money you make, but because of who you are in Christ'. 'He should see your inward beauty more than your outward beauty'. The bible verse aptly explains this part and in my opinion true beauty radiates from within. Nobody is saying that you should not find your future spouse attractive because you should but more importantly their characteristics should be beautiful too. In the meantime let us not entertain guys because we are bored,lonely or feel that we are 'missing out'. The more time we spend with the wrong person the more we are delaying what God has in store for us. One thing we must know is that God won't wait forever and if we aren't careful we can miss the 'perfect will' for our lives and instead settle for the 'permissive will' but that is a topic for a whole other day. The human mind is a wonderful thing and before we embark on a relationship I think we know when we should not continue but sometimes we continue because we feel we can 'change' the person. If you hear that voice and you know it is the Holy Spirit prompting you to stop then please stop. It does not matter how many years that you have 'invested' into the relationship. It does not matter if you are engaged and invitations are already out- STOP. 'A broken engagement is better than a broken marriage.' It is so much easier said than done but God will definitely give you the grace to cut it off if you desire it. Maybe it is 'too late' and you have married someone that you know you shouldn't have ; God is still in the business of restoring marriages and He will do it for you. You will have to especially exercise the fruit of patience but don't ever feel that God will just give up on you. I promise you it is so worth it to wait no matter how long it may seem to take! I'm not saying this in the comfort of my matrimonial home with any husband to co-sign this- I'm saying this as a Christian single woman who has often struggled with waiting and trusting God that it will be worth it. Often times it is so easy to feel like you are 'missing out' or if this waiting will even be worthwhile. It's ok to be honest with God and tell Him 'I'm struggling out here'. Before you've even uttered the words He knows your silent struggles. He knows about the times where you've felt that you need to 'dilute' your Christianity because guys have found your own to be too 'concentrated'. He knows about the times where you have entertained a guy who is just a church goer but isn't really going anywhere spiritually with you. He knows and He still loves you all the same but girls we need to change; our mindset needs to change. It is either we trust God 100% with our love life or not at all. So from one sister to another, let's do this-together. If you need to get another sister in Christ so you can be accountable to someone then do it. This post is my own way of accountability and also encouraging myself and others too.